Amazon.com has announced that Kindle for Android, the free application that lets readers around the world enjoy Kindle books on their Android-powered devices, now includes a number of new features that make it even better. With the newest update, Kindle for Android now enables customers to search the full text of Kindle books by voice or text, seamlessly look up words and phrases in Wikipedia, lock screen orientation in portrait or landscape mode, and view details about a book on Shelfari, the books-focused social networking site — all without leaving the app. Additionally, Kindle for Android is the only reading app for Android-based devices that allows readers to add notes and highlights to books, and have them automatically synchronized between devices. The app is available from Android Market and customers who have already downloaded the app will receive the update automatically. Customers can learn more about Kindle for Android at www.amazon.com/kindleforandroid and download the app from Android Market. + Search within the book: Customers can either type or speak a word or phrase to search within a book. + Add, Edit and Delete Notes and Highlights: Kindle for Android is the only reading app for Android-based devices that allows readers to add notes and highlights to books, and have them automatically synchronized between devices. + Wikipedia Lookup: Look up words and phrases in Wikipedia simply by selecting text. + Shelfari Book Details: For the first time, customers can view additional book details from the books-focused social networking site Shelfari. Readers will find a description of the book, synopsis, summary, cast of characters, and many more features, and be able to view real-time discussions that the Shelfari community is having about the book. + Orientation Lock: Choose to lock the orientation of their screen in landscape or portrait mode to allow for comfortable reading in any position. 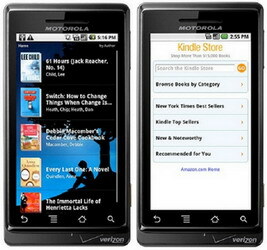 0 comments on "Amazon Kindle for Android updated with voice search, Wikipedia lookup, and more"